A reader recently asked me how an overcoat should fit – around the armholes, in the shoulder width – and given that I already had a post planned on this fitting on a Cifonelli overcoat, I thought I would combine the two. The central problem with overcoat fit is that you don’t always wear it over a jacket. Tailoring has substantial shape in the chest and shoulders, so for an overcoat to sit comfortably over the top it must be both bigger and wider. That can make for a pretty bulky garment when the tailoring is removed. There’s no easy solution to this: it’s simply a compromise. The fit on the shoulders and waist must be a little bit big with knitwear and a little bit small with an overcoat. With the Cifonelli double-breasted overcoat I’m being fitted on in the pictures, that’s just what we’ve gone with. You need to err just on the side of big, so that the suit underneath is not actually squashed (risking creasing at best and damage to the shoulders at worst) but is just a little less easy to get on. For anyone deciding between ready-to-wear overcoats, that’s the line you need to stay on the right side of. There are a couple of other things that can help. One is to minimise the padding in the shoulders. An overcoat can be big enough to fit over a jacket without adding more padding to the padding underneath. This is Cifonelli’s natural style, so that wasn’t a problem. With my Vergallo top coat that I had made last year, I went to the extreme of having no padding – just canvas. The Vergallo coat also had a shirt-shoulder (sleeve running underneath the shoulder instead of on top). This didn’t necessarily make it easier to wear with both tailoring and knitwear, but it did make the coat much more casual with the latter, which was good. Cifonelli’s strongly roped shoulder will make it very dashing, but not quite so suited to denim and boots. The extreme of this solution is of course a raglan shoulder, where the sleeve runs right up into the collar. Here you don’t even have a shoulder line to get in the way, but for me you also lose too much shape and style. I’d only recommend it for raincoats. Finally, you can mitigate the problem by adding an adjustable belt to the overcoat, so that it can be cinched a little bit with knitwear. 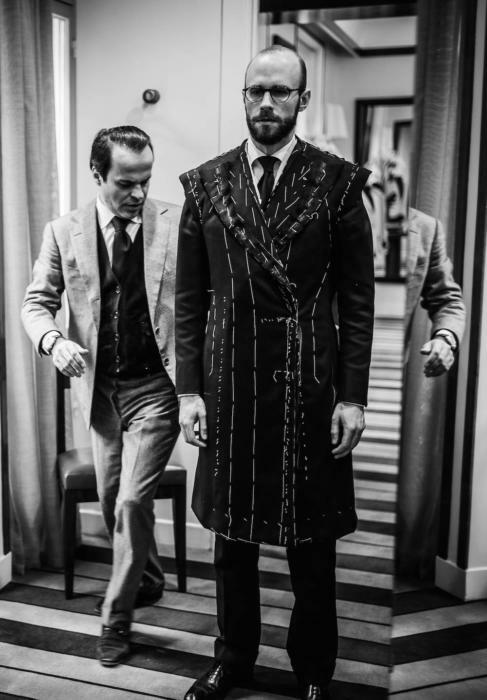 I’ve tried this on most of my bespoke overcoats over the years, but the construction we came up with on the Vergallo loden was by far the best. It’s all about hidden poppers. The Cifonelli overcoat should be ready in a few weeks, so I’ll post something fuller on it then. For the moment, suffice it to say that if you’re only thinking about bespoke overcoats now, it’s likely too late. I actually started this one with Lorenzo back in December last year, but put it on hold for six months when it became clear it wasn’t going to be ready in time. Now is the time to buy ready-made, or commission for summer. You can follow the discussion on How an overcoat should fit (Cifonelli fitting) by entering your email address in the box below. You will then receive an email every time a new comment is added. These will also contain a link to a page where you can stop the alerts, and remove all of your related data from the site. Hello Simon! I am in the process of “designing” my first bespoke purchases, 3 suits, 2 sportcoats and 2 overcoats (one double breasted made especially to be worn over suits and the other single breasted to be worn over knits). I have a question. I am very attracted to the Tom Ford suits aesthetic so I think to make them similar, with strong shoulders, very high armholes, very slim waist, longer jacket, peak lapels(though not the extra wide ones) etc. My worries are that maybe they will look dated in 2-3 years? What should I do, what do you recommend? Any tips on great menswear stores/areas in Paris? I am mostly looking for knitwear at the moment, but it is also always fun to look at other stuff. Now I realize there is no perfect solution for the fit of an overcoat in order to wear it for both jacket and knitwear. I personally prefer to buy/make it slightly oversized, although otherwise I usually wear slim clothing. I have a technical question, giving that I would like to make made a versatile sport coat in mid grey (as you recommend as for staple) to my local tailor. The thing is that he does not make the neapolitan shoulder, and as he is quite young (in the ’40) I would like to encourage him to try this new shoulder construction. Do you think is easy to a tailor to lear how to do it? 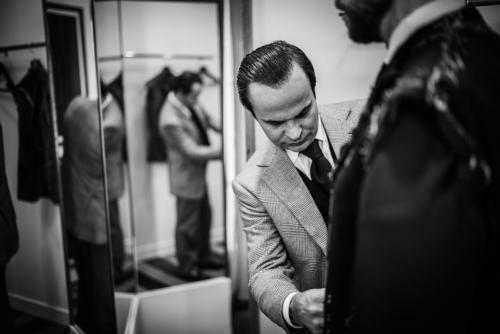 I’m contemplating about my first bespoke overcoat. Would you suggest a cashmere lining or a silk lining for an overcoat? And why? Hello Simon. 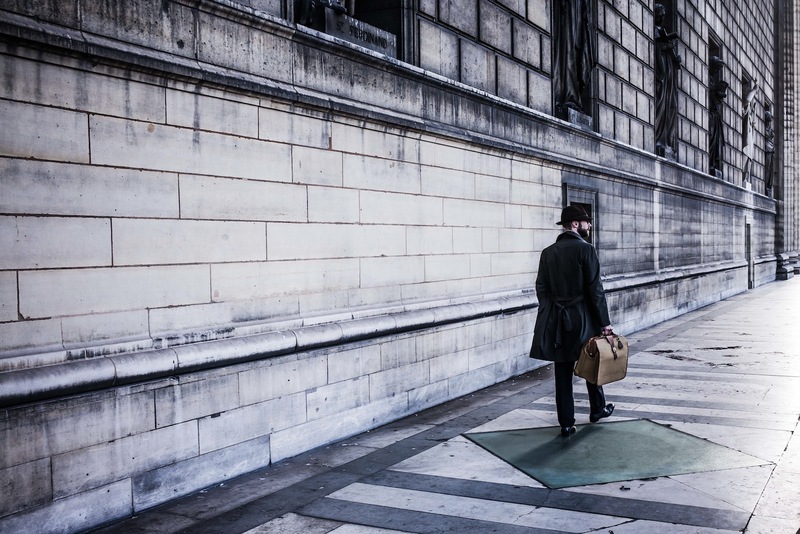 I read this post with great interest as I too just had an overcoat made with an interesting twist that I copied from an old Crombie overcoat that belonged to my father. The sleeve is set in on the front, but raglan in the back. This provides the well tailored shape one might desire across the chest while providing greater roominess and ease through the shoulder blades. I don’t know if anyone does this anymore. 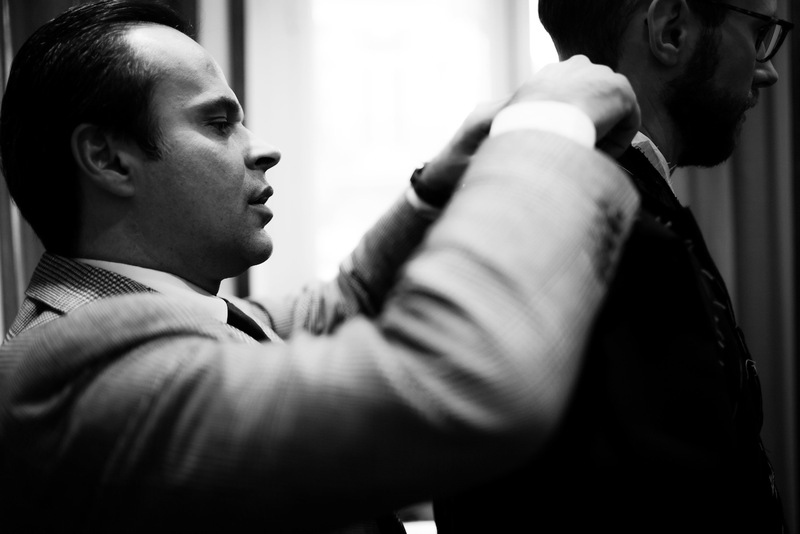 It was certainly new to my tailor who admirably rose to the challenge and did a pretty good job. If there’s no need of layers underneath an overcoat – and by that I mean a coat – then there’s likely no need for an overcoat. If the weather dictates knitwear, or a shirt and knitwear, there’s no sense in wearing an overcoat rather than a coat. A topcoat or raincoat perhaps, but going to a lot of unnecessary trouble to ‘design the perfect overcoat’ is overkill. Any idea where to buy a RTW double breasted navy overcoat that doesn’t have huge shoulder pads? What size of buttons do you use for your overcoat. My jackets horn buttons are 2cm in size. Should I buy my overcoat horn buttons a little bigger in size like 2,5cm or even bigger? Hi Simon, are you able to do an article on raincoats? Thank you. Did you ever take delivery of this coat? Curious to see the results. I’m contemplating an overcoat in lightgrey herringbone but I’m concerned the finished product would be too bright and that navy or camel might be a more versatile choice. What are your thoughts on fabric&color for overcoats? hi simon do you know if bespoke tailors in the UK, France, or Italy can make a bespoke wool trench coat? As i understand trench coats have a few extra details such as a gun flap, storm shield and a throat latch and hook-and-eye collar. I am no expert but it does seem plausible that trench coats may be constructed differently than top coats since they where designed with the needs of soldiers in mind. Anyways do you know of any bespoke tailors capable and willing to cut a trench coat? I did not quite understand it, does your Cifonelli overcoat have any padding? And I was wondering, how to size the shoulders when the topcoat has to have soft shirt shoulders and one wants to wear coats with or without padding underneath or even knitwear ? And how to size the shoulders when the topcoat has to have a regular shoulder, padded, or even with no padding at all if such is possible depending on what one wants to wear underneath? And in general, for topcoats or jackets, is padding possible / expedient with shirt shoulders? And are regular shoulders possible / expedient without padding at all? Many thanks again for sharing your experience here with us/me! Padding in the shoulder and having a shirt shoulder are entirely separate. The latter is just about where the shoulder joins the sleeve. So there can be padding also with shirt shoulders, right? Can there also be regular shoulders without padding at all? Would be very helpfull I you had some examples from your topcoats and coats as a reference for me. So I suppose that your new ulster coat has padding and is a regular shoulders and that your Caliendo coats with the shirt shoulders look at least like no padding at all? Have you ever comissioned a jacket or an overcoat with regular shoulders and no padding at all? Thanks. Sorry, as it was last winter I didn’t realise you meant that one. And yes, plenty of Caliendo jackets.